I was not a picky eater as a child. My parents had no trouble convincing me to eat my peas, artichokes, and even spinach (in the form of my dad’s delicious Thanksgiving stuffing). But I drew the line at Brussels sprouts. There was just no way for me to get over that cabbagy smell. Then, a few years ago, a colleague brought in roasted Brussels sprouts for a work potluck. I can’t say that they looked particularly appetizing—they were just blackened, slightly shrunken versions of the mini-cabbages I so disliked. But after one bite, I was sold. YUM! 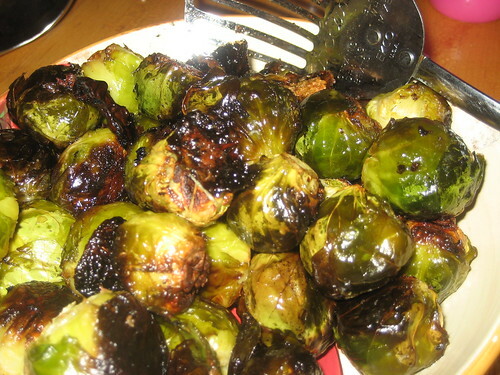 Roasted Brussels sprouts, I found, were slightly sweet and completely addictive. They are now my go-to vegetable. What does this have to do with math education? Well, a lot of kids (and their parents) think of math as being a lot like a stinky vegetable. They take it because it’s required to graduate, and they may know it’s good for them, but they don’t find it enjoyable. That’s why I get so excited when teachers share lessons they’ve created that make math a bit sweeter for students, without losing any nutrients in the process. Take, for example, this lesson described by New York City educator Karen Blumberg. Here’s another recipe for delicious math: A lesson posted by Atlanta teacher Megan Golding in which she takes the potentially dry topic of circumcenters and turns it into a juicy, engaging, school-wide treasure hunt for 300 students. Megan’s lesson involved a lot of time and planning; she collaborated with other math teachers and involved them, along with school administrators, in the treasure hunt itself. I love that she ran the project on the day before Thanksgiving, a day when students and teachers might otherwise be counting the minutes until the start of the long weekend. To Karen, Megan and the many other great teacher-bloggers out there, thank you for sharing your lessons. Just as my friend Christa shared her recipe and transformed my view of Brussels sprouts forever, your posts will give other teachers ideas for making math lessons richer, more engaging, and maybe even more appetizing for their students. I hated Brussels Sprouts! I hate them more now that I see that the proper spelling of that vegetable makes both words plural! And what does Brussels have to do with sprouts! Do they grow only in Brussels? Ok, enough of my rant on that dreaded vegetable. I did end up eating them. Not my favorite vegetable but edible. All in all, I think I can live the rest of my life without eating another side dish of Brussels Sprouts. But I can’t go the rest of my life without learning math and then using it. That should be true for everyone else out there! And I can’t go the rest of my life enduring math lessons that aren’t rich, engaging and thought provoking. Kudos to those teachers who are able to engage their students with those great lessons that you shared with us, Elizabeth. Thanks for including me and my lesson in your post! I’ve been a fan of Geometer’s Sketchpad since a professor first introduced me to it in 1994. As a math teacher and a technology integrator, I’m perpetually grateful for the available lesson plans, activities, and animations shared online. @Karen: It’s really wonderful that you are helping middle school teachers use Sketchpad in such a creative way! I look forward to reading more of your blog posts.